Anderson’s Salamander is a unique species of salamander that is only found in Lake Zacapu, Mexico. 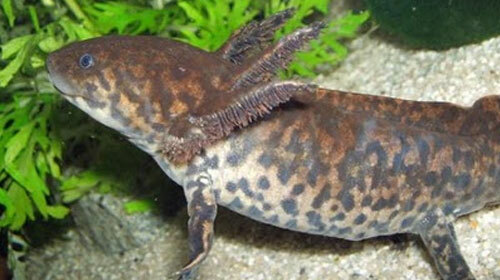 This rare salamander is unique in that it retains juvenile characteristics throughout its life, essentially coming into sexual maturity very early on in its lifespan. Sadly Anderson’s Salamander is currently classed as critically endangered due to pollution in Lake Zacapu. 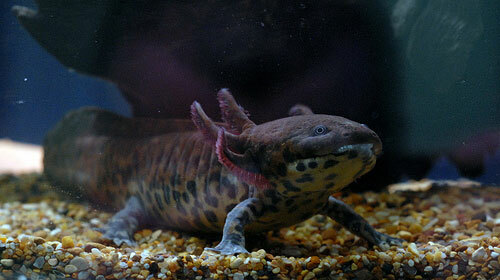 Anderson’s Salamander’s are completely aquatic, spending all of their lives underwater. The only habitat of Anderson’s Salamander is Lake Zacapu and the connecting streams and rivers. Lake Zacapu is located near Zacapu in central Mexico. Anderson’s Salamander’s are a medium sized type of ‘mole’ salamander, reaching a maximum length of 350mm from head to tail. Typically the males of the species larger than the females and this is due to the males sporting a longer tale than the females, these unique salamanders never shed their tail like other species. Anderson’s Salamander’s closely resemble other ‘mole’ salamanders with characteristics such as a long flat body, and large flat head with a very big mouth. The skin of Anderson’s Salamander’s is very smooth and distinct noticeable ridges run the length if the salamanders sides. The most recognizable feature with these types of salamander is that of their large external gills. As with other salamanders of this type, male Anderson’s Salamander’s are recognizable throughout the breeding season by their swollen cloacal which is the region under the base of the salamanders tail. The base color of Anderson’s Salamander is a mixture of brown and red which varies with each salamander. On top of the red/brown base the salamanders are marked with black patches. Anderson’s Salamander’s keep their juvenile features even when maturing, always giving the impression of a larval salamander. These salamanders spend their entire lives in the same body of water from hatching, to breeding and eventually death. The cool waters of Lake Zacapu are the perfect habitat for Anderson’s Salamander’s and provide food such as crawfish and snails. Even through each salamander will spend their entire lives within the confines of these waters parental care is non-existent with eggs being laid and the eventual young being left to fend for themselves.